The LOADMASTER Series M mechanical motor truck scale utilizes a welded steel pipe lever system consisting of two (2) or more sections. The levers are weldments of heavy steel tubing, plates and structural shapes. The system is a time proven free-floating design utilizing a dual link suspension with bumper checking. The knives and bearings are designed to be easily removed and replaced in the field for minimum down time and maximum accuracy over the life of the scale system. The final product is painted with a rust inhibitive zinc chromate and finish coated with a durable weather resistant enamel. The product is covered with a 5 year warranty. 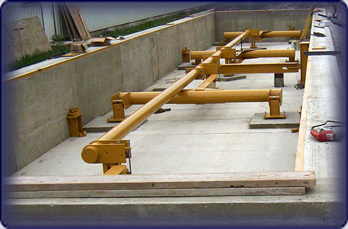 Custom lever multiples: Contact us if matching up to an existing balance beam. Bridge: Pre-fabricated and welded together, ships legal width at 8′ wide. No permits required. Optionally provided as “bolt-together” if desired. Platform Length: From 12′ to 105′ with a maximum bridge span of 28′. 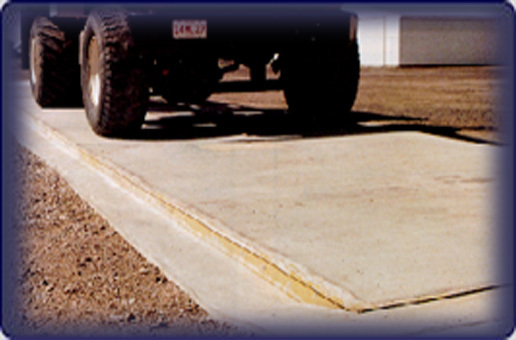 Platform Width: Standard is 10′ wide, optional approved widths from 7′ to 12′.